Today is about creating a vision or definite major purpose (DMP). There's no point in effectively managing your time if you have no vision or purpose. It would be like using a road map with no destination in mind. What is the top purpose for my life? Thinking through these things and several other questions really helped me figure out what I need to be doing on a day to day basis. I even made a collage to hang on the wall of my studio for inspiration and motivation. 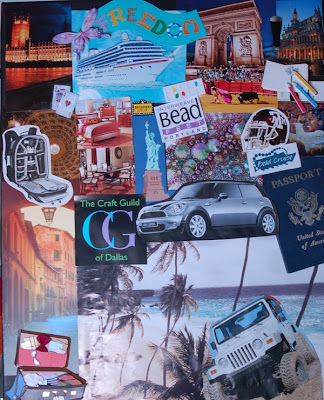 I have a lot of pictures of places I would like to travel, a picture of the custom mini cooper that I've been wanting, even an Aggie football helmet because I would love to have season tickets. I'm also a scrapbooker and had fun with my stickers, though the suitcase sticker (bottom left) was purchased specifically for this project. Click here and enter your email in the big box to the right to start working on your vision. In the interest of full-disclosure, I am now a member of the Internet Business Mastery Academy, but all the materials I've talked about are free and you can unsubscribe from their newsletter at any time. It is just the best tool I've come across for creating your vision. Please leave comments!